Craps is easily the most intimidating game inthe casino. The layout looks like some kind of crazy puzzle and thereare seemingly dozens of different bets, governed by complicated rules. So we’lldo our best in this lesson to make this crash course as painless as possible. The trick to making craps easy is simple: Learn only what you need to know,and ignore everything else. You can play craps by knowing just one bet, the PassLine bet, so that’s what we’ll teach you here. You can certainly learn all the otherbets if you want (see our list of bets article), but fornow the Pass Line is all you need to know. The first thing you’ll need is chips. Just put your cash down on the table andthe dealer will give you chips for it. They don’t make change, so any money youput down will be turned into chips. But you don’t have to bet all of it. When you’redone playing just take any chips you have left to the cashier booth to turn themback into cash. The minimum bet for the table will be listed on a sign at the table,usually $5 or less. The players all take turns rolling the dice although everyone’s betting on the sameroll. You’ll win or lose your bets whether you’re the one rolling or not. And youdon’t have to roll the dice if you’d rather not; when it’s your turn you can justpass to someone else. Whoever’s rolling, they keep rolling until they roll a losing7, known as “sevening-out”. We’ll go over that later. All numbers below refer to the total of both dice. When we talk about rollinga 3, we’re never talking about getting a 3 on one of the dice, we’re alwaystalking about getting a total of three on both dice. Make sure you’re clearon that or it will get confusing…. 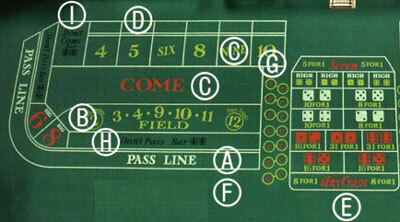 This is the main bet in craps, and most players make it. (They also make a lot ofbad bets in addition to this one, but there’s no rule that says you have to beton anything else.) The Pass Line bet has a house edge (casino profit) of only 1.41%,making it one of the better bets in the casino. 7 or 11You win. The shooter then rolls another Come Out roll. 2, 3, or 12You lose. The shooter then rolls another Come Out roll. 4,5,6,8,9,10Enter the Point round. (more on this below) So you’re either going to win,lose, or go to the Point round. If you win the dealer will pay you the amount ofyour bet. (If you’d bet a $5 chip, they’ll give you another $5 chip.) If you losethen they’ll take your chip away.If you didn’t win or lose right away then you go to the Point round, and the dealerturns the hockey puck to ON and places it on the number that was rolled (4,5,6,8,9,or 10). That number is called the Point. Now you’ll win if the shooter rolls thePoint again, and you’ll lose if (s)he rolls a 7 first. Rolling a 7 before rollingthe point again is called sevening out. Win by rolling a 7 or 11 on the Come Out roll, or rolling the point twice. Loseby rolling a 2, 3, or 12 on the Come Out roll, or rolling a 7 before rolling thepoint twice. The Pass Line bet is the only bet you have to know for craps. You could go playcraps now with what you’ve already learned. And in fact, by just making the PassLine bet you’ll have a better chance of winning than most craps players, since mostplayers make sucker bets which are just throwing money away. But even though you know enough to play craps now, you really should learn justone more bet, which will increase your chances of winning even more. We cover thaton our separate page about the Free Odds bet….